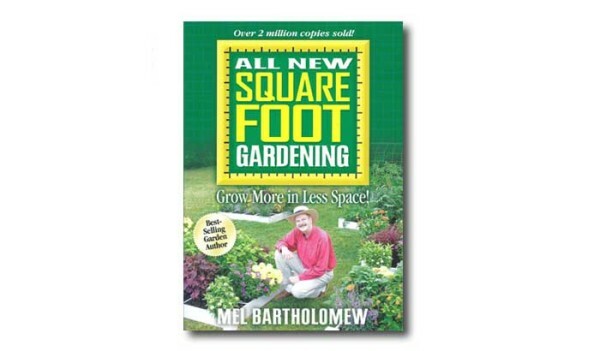 This is the only book you’ll need for best garden you’ll ever have in your life! Guaranteed. When you want to start something new but you are not sure how, you probably get a book first. Well if it is gardening, this is the book for you! The SFG Method is so simple and easy, as well as so common sense, that we like to say in our lectures that a beginner can learn the basic system in just one hour! An expert will take about three weeks! We don’t need or use fertilizer so you don’t have to learn all that NPK stuff. Or what- when- and why to apply. Mel’s Mix has all of the nutrients your plants will ever need – all organic – all natural– it’s all in the compost. You don’t have to dig up your existing soil so you don’t need any tools: shovel, rake, spade, fork, pick ax, and you will never need a plow or rototiller. That is money shaved in your pocket. SFG takes only 20% of the space of a row garden so now it can be located close to the house – easy access, easy care. You can even put your SFG Box right on a porch, patio, deck, or even roof top. You can’t do that with row, raised bed, or any other type of gardening method. And it goes on and on – so many advantages, yet so simple! 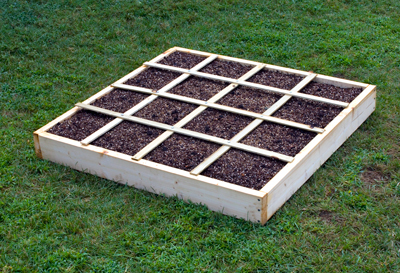 4×4 Grid – Ready to Plant! And it’s all in this book – full color – easy to read – many pictures – many charts to lead the way to tell you what, when, and how. Once you have started, you could not find a better gift to give for the holidays then the all new SFG Book. I have both of your books…will never let go of the original book, because there are so many, many pearls of wisdom in there and I like looking at how far the SFG concept has come from waaaay back when when I was a double-digger.! It sure has come a long way over the years. Thanks to people like you for your response! I’ll keep working to improve it. Thanks for your comments and keep watching, I’m going to share your humor this week! I also have both books now. I just bought the new book tonight. I found the first book in my house, right after I bought the house 23 years ago. The previous owner left it in the utility room. Now that my kids are grown and not using the backyard, I was planning on putting that first book to use. After a few Google searches and reading a few articles and blogs about the new method, I decided to get the new book. Mel, thanks for a wonderful system. BTW, I remember watching your program on PBS and enjoyed it a lot. Thank you so much, Joe, for your letter. That’s a very inspiring and interesting story. Twenty-three years that book sat in the utility room. I have to laugh over that, but now you’re going to put it to good use. Go ahead and read the ALL NEW book, which has 10 major improvements over the old system, but you’ll still get a lot out of the original book. That was the book we sold when my 30-minute program was on PBS for five years. So that was a good book, but the new book is even better because it’s so easy, it’s so much easier now and so much simpler. I’ve known about those original PBS TV show. We’ve taken the original tapes and re-digitized them into DVDs. Updated them a little bit with some of these 10 major improvements, and we’re going to have those ready for sale as a download very, very soon, hopefully next week. So watch our website. Here’s a link to the bookstore where you can order those videos (they’re not there yet though). You might enjoy them because you may remember actually seeing some of them. And don’t forget to encourage all your neighbors and folks at church, and work, and everywhere else that Square Foot Gardening is the way to go. Thanks again for your letter. I really enjoyed reading it.